Yes. We are operational six (6) days a week and can deliver skip bins to you on Saturday. You can pay for your bin with cash on delivery to the driver or you can provide a credit card when you book your bin online or over the phone. Your card will be debited on the day of your delivery. We also accept direct deposit which needs to be paid before your bin will be removed. When ordering a heavy bin or a specialised bin we do need a credit card for security. We have created several ways to order making it easy for you. Call and speak with a real person, order online, book your pick up on line, or even email you requests. Call between 8am and 5pm Monday to Friday or Saturday between 7am and noon. Melville Bin Hire has an extensive range of skip bins so they have the flexibility to schedule bin hire for 7 day periods. 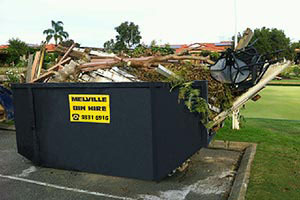 Melville Bin Hire guarantees a 48 hour delivery turnaround – order today and the skip can be delivered tomorrow. Same day delivery depending on how busy we are! A skip or skip bin is an open design bin often used at construction and renovation sites. The skips are delivered to you empty, and once filled picked up and taken to the tip or dumpsite. A skip ranges from about 4m³ to about 12m³, and are made of steel. Skips are usually placed at the front of construction sites and house verges, which makes disposing of waste easy for all. Liquid, food and hazardous wastes are not permitted to be placed in bins. Hazardous wastes include asbestos, poisons, paints, oils, gas bottles and toxic wastes. If you have hazardous wastes that you need to dispose of, contact us for more information. We do offer Asbestos specialty bins, see Asbestos FAQ for more information.